This year I've decided to create challenges for myself as I strive to use my stash (no new scrapbooking purchases except adhesives for now!). A few weeks ago, as I was incorporating new papers into my paper drawers, I ran across these two older books of pre-printed patterned papers. My sister gave me these books when I was visiting this past fall (and they were still in the to-process pile!). 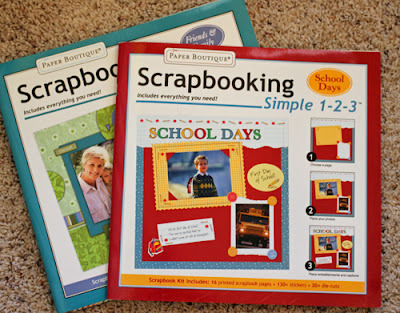 She doesn't scrapbook as much as I do and thought I might be able to find a use for these. I haven't used pre-printed pages in years, so I thought it would be fun to challenge myself to use a few of them before I took these books apart and incorporated the remaining pages into my paper drawers by color. I'll be sharing the results of my challenge over the next several days. Here's one of the papers I chose from the School Days book. 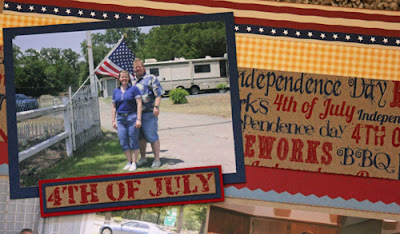 I decided to use this as the base for a page showcasing a few photos from this past Fourth of July. 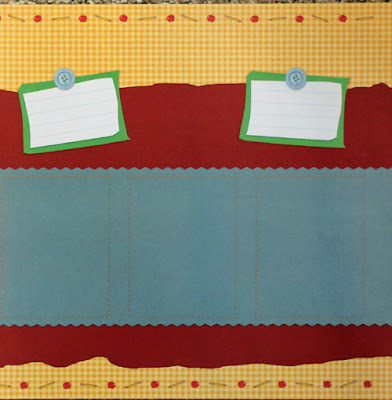 I liked the idea of different strips of paper going across the page. 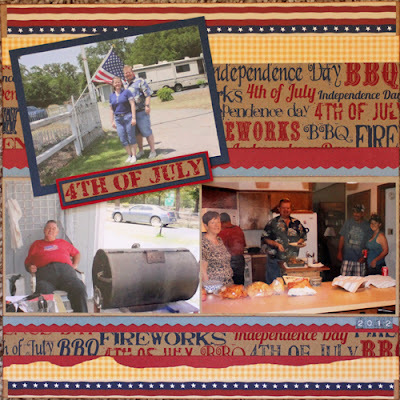 I started with a Fourth of July kraft cardstock patterned paper and covered the green journal spots, then added additional patterned paper at the top & bottom to cover the pencil & apple border. There's still quite a bit of the original background showing - the yellow check pattern, the red, and the blue decorative border. Yet, this School Days paper is now showing its patriotic side! Do you have any of these pre-printed patterned papers hiding in your stash. If so, join me and challenge yourself to use them on a new layout soon! great idea, I'm sure I have papers like that. Wow! You certainly made those pre-printed pages your own. I absolutely love the layout. You made a good job of this - I find the printed papers really difficult to work with. I also love the juxtxposition of 'no new supplies except adnhesive' an d'while I was putting new papers in the drawers'!!!! Base is an understatement! I've always hated pre-printed pages because I approached them as needing to fit things into the spaces exactly as shown. You've shown that you can make it totally your own! I seem to remember having some preprinted papers years and years ago but I don't know what happened to them. I love that you used the page for inspiration but also included other papers and did your own thing with it. Looks great! Happy weekend. You did a great job with these papers! I love the layout, and wouldn't have been able to "see" it when I looked at the original paper. I've never thought of using pre-printed pages in that way....I got rid of all of mine a long time ago! You have really made the most of this one - and your determination to use up everything and not buy anything is admirable. Yuk to the papers - but WOW to your page! 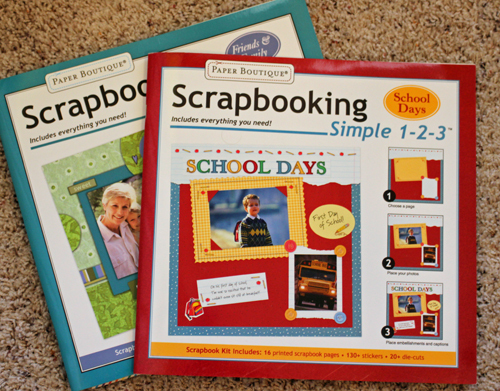 How clever are you to take a basic, dated set of supplies and really make them rock! Awesome work! Ah see reading backwards means you make discoveries that explain where the printed pages challenge comes from. Fun to see what the pages were before you started.